Contemporary Brazilian Rock Crystal Table Lamp. Solid High Grade Beautiful Semi-Precious Rock Crystal Stone Hand-Cut Into Spheres of 3 Different Sizes. Spool-Shaped Spacers Crafted Using Lost Wax Bronze Method of Casting & Finished in a High-Quality Genuine Antique Silver Finish. All New Clear Wiring & Single Cluster Body with Knob Switch. Machined Ball Finial, and Harp Finished in Hi-Polish Nickel. 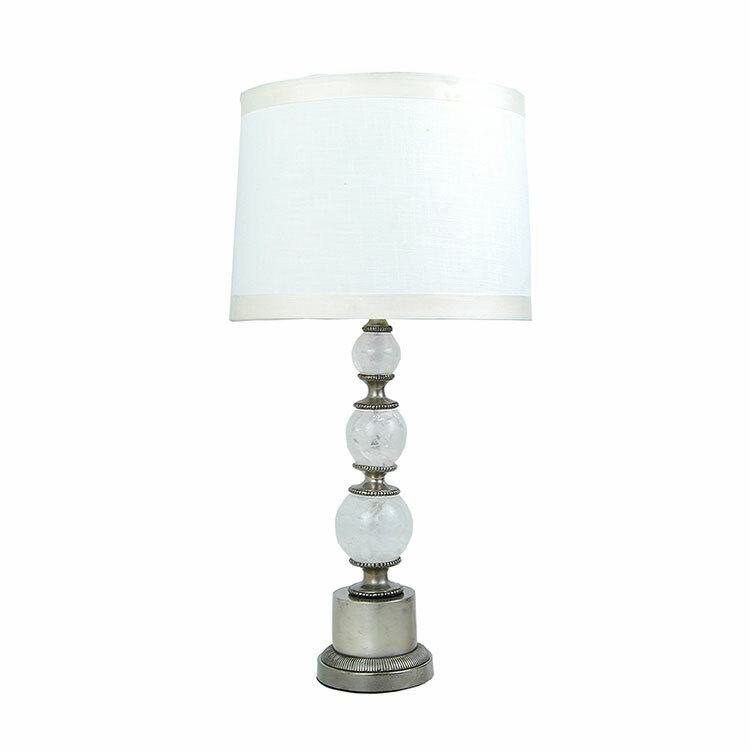 Base is a Solid 6″ Cast Bronze Casting with a Genuine Antique Silver Finish. ADD Custom Lighting Utilizes the Best Quality Materials, Processes, Finishes. Made In-House in Our Southern California Facility.